Singapore is the world’s fourth-largest financial centre. The city-state’s economy is one of the world’s most open, and GDP growth is predicted to remain strong at 3 to 4 per cent per year. Singapore is the EU’s largest trade and investment partner; a Singapore-EU Free Trade Agreement will be ratified in 2015. 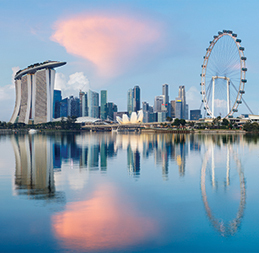 In 2014, Enterprise Ireland and IDA Ireland organised a four-day trade and investment mission to Singapore and Malaysia, resulting in contracts worth €25 million. For more detailed information when trading with Singapore, download our Singapore Fact Sheet. For an estimate of landed costs (duties, taxes and other import fees) for shipments going to Singapore use the free and interactive DHL Express Trade Automation Services (TAS) tool, tas.dhl.com. TAS also provides information on regulations compliance and trade documentation. Dutiable regardless of CIF. Invoice must state bottles per shipment, alcohol strength, brand name, bottle volume. Wine: specify if sparkling or still. Receiver to obtain import licence/ approval from Singapore’s AVA. If unprocessed: provide Convention on International Trade in Endangered Species of Wild Fauna and Flora (CITES) certificate from country of origin. Provide title list. May be inspected by Singapore’s MDA. Not acceptable if activated and/or in bearer form. Approval from Singapore’s AVA and proper packaging required. Subject to approval from Singapore’s IDA. Mass distribution: importer to provide import licence. Receiver to obtain approval/import license from Singapore’s HSA. Private individuals: provide doctor’s prescription for contents. Drugs/medicines: invoice must state name, brand, quantity per bottle, weight of each capsule, reason for import & product composition. Can be shipped as documents regardless of weight. Receiver to confirm the item is on Singapores MDA approved list of games. Submit title list to Singapore’s MDA for approval. Receiver to provide declaration to Singapore’s MDA. For personal consumption: receiver to provide doctor’s prescription. For retail purposes: receiver to obtain import licence from Singapore’s Drug Administration Department. Flashpoint must be above 60.5°C. Contact DHL Customer Services before shipping. Receiver to obtain import permit from relevant government authorities prior to shipping. Contact DHL Customer Services before shipping. Shipper to provide Phytosanitary Certificate. Dutiable regardless of CIF but not controlled. Invoice must state number of packages in shipment or weight per shipment, brand name and numbers of sticks per package. Import controlled by Singapore’s State Police, Arms & Explosives Licensing Division. State ‘TOY GUNS’ on Waybill and commercial invoice. Provide document proof by manufacturer confirming the product is a toy and not a replica of a real firearm. Destination importer or receiver to obtain licenses from Singapore’s HSA. For military equipment and strategic goods & technology (including ‘dual-use’ goods with both civilian and sensitive military applications) machines please contact DHL Customer Services before shipping.